Blue-eyed Willow is dressed for a slumber party and ready to snuggle. Her brightly colored hair, made of knot-proof fabric strands, has a cool retro patchwork pattern that matches the trim on her comfy Pyjamas. Her body and clothes are made of wonderfully soft microfleece, and her high-quality fill is squishably squeezable. 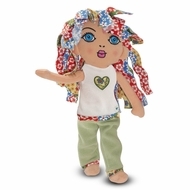 Share this huggable friend with your little doll fan.